Not too long ago we met our pals Mel and Flash (founders of the awesome craft beer app and site TapHunter) for drinks. We started at the El Dorado for a Bourbon Mule then migrated to one of my favorite spots, Neighborhood. We order up various beers, cocktails (on tap!) and settle in for some lively conversation in the noisy bar. Time for the second round and Flash calls over the manager on duty, a quick conversation, some head nods and the manager is off behind the bar. In moments he returns with a very dark cocktail on the rocks garnished with an orange peel. Neighborhood lists only 2 cocktails on their menu but it turns out there is somewhat of a “secret” drink menu that regulars know. Among the unlisted is the Negroni Stout and it’s simply wonderful. And weird. It’s popular with the brunch scene there but I could drink these anywhere, anytime. The bitter-sweet of the classic negroni is bolstered by the robust coffee and chocolate tones of the stout beer. I don’t know who’s idea this was but we endorse it. It makes a refreshing substitute for your Sunday Bloody Mary. For our homemade version we use Ballast Point “Victory at Sea” a fantastic seasonal coffee-vanilla porter which really pairs nicely. You can use your favorite stout or porter. Twist the orange peel to extract some oils then rub the peel around the inside of a large tulip glass. Fill the glass with ice and set aside. Combine gin, vermouth and Campari in a shaker full of ice, shake well and strain into the rocks glass. Top with the stout or porter and stir gently. Garnish with the orange peel. We love the innovative use of beer in classic drinks. Have a favorite beer cocktail? We want to know. Drop it in the comments, share it on Facebook or tweet us about it. That was a delicious cocktail! I enjoyed having a sip of it with you guys there. I forgot about how good it was… I shall have to make one of these soon. 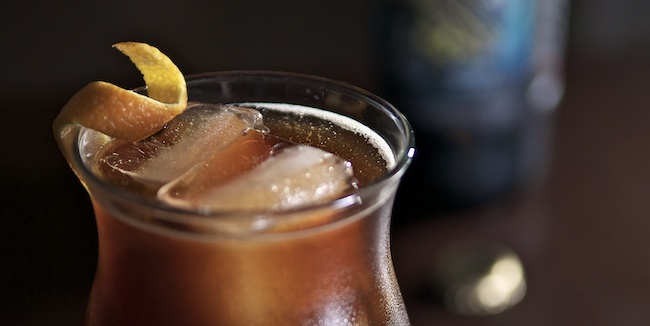 My current favorite beer cocktail is the Black Flip, via the PDT Cocktail Book. It’s a rich cocktail great for this cooler time of year here in SD. Add all ingredients to a mixing glass and swirl to decarbonate the beer. Dry-shake, then shake with ice and strain into a chilled fizz glass. Garnish with grated nutmeg and enjoy. It’s a tasty nightcap, that’s for sure. Make sure you decarbonate the beer a fair amount, and have a tight seal on the shaker!